AUGUSTA, Maine — A new book by progressive blogger and columnist Mike Tipping asserts that Gov. Paul LePage met regularly with a group that believed it could arrest both Maine Speaker of the House Mark Eves and state Senate President Justin Alfond and put the pair on trial for high treason. Staff for Eves and Alfond said they too were contacted by members of the Constitutional Coalition at the State House and that members of the group delivered documents to both men at their homes. “The authorities, including Capitol Police and the FBI, were notified immediately by legislative staff members on those occasions,” a joint release issued Monday by Alfond and Eves stated. Tipping, who also works as communications director for the liberal Maine People’s Alliance, wrote that documents show LePage met with the group at least eight times over a nine-month period. LePage met with the group several times in 2013 — one meeting lasting nearly three hours — before lawyers on the governor’s staff issued a memo warning LePage the group had no basis in law for their assertions and he best disassociate with them, according to Tipping. Adrienne Bennett, LePage’s press secretary, said the meetings were part of the governor’s “open door” policy and that his decision to meet with people does not mean he endorses their views. She said the tradition of meeting with constituents was one LePage started when he was mayor of Waterville. 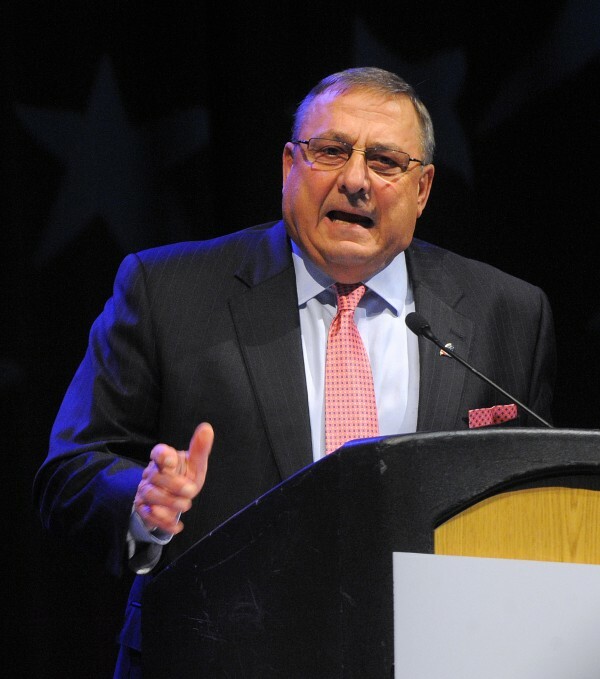 LePage also attended a talk by Michael Coffman in Naples at which LePage gave opening remarks and then stood by as Coffman presented information that alleged a United Nations takeover of the U.S. and an alleged plan by President Barack Obama that would force the teaching of socialism in public schools. According to Tipping, the Maine group known as the Constitutional Coalition also consider themselves “Sovereign Citizens” who believe in a rigid interpretation of both the state and U.S. constitutions. The first chapter of Tipping’s book, “As Maine Went,” was released Monday on the political website Talking Points Memo and is likely to cause a political stir in Maine, where LePage is locked in a heated re-election bid against Democratic challenger Mike Michaud and independent Eliot Cutler. In his book, Tipping says the group wanted LePage to remove language in a Maine Criminal Justice Academy training manual that deals with the Sovereign Citizen movement and makes note that the FBI considers the movement a domestic terrorism element. LePage did not comply with the group’s request. Members of the Maine Constitution Coalition say local, state and federal government officials and police are the terrorists. “We are sitting ducks for official harassment and are getting wrongfully harmed, scammed, beaten, drugged or otherwise deprived of our life, liberty and property by a whole system of administrative terror which has grown up throughout the country,” a statement on the group’s website reads. David Sorensen, communications director for the Maine Republican Party, also noted that the group criticized LePage for some of his education policies and appointments.